There were a lot of talks that Intel is no longer paying attention to enthusiasts market especially during the time when the Haswell-based 4th generation Intel Core processors first hit the market last year. This is because many believes that Haswell products are focusing more on power saving features and integrated graphics performance rather than enhanced CPU capabilities. Nevertheless, Intel insisted that enthusiasts market is still an important part of the company’s desktop business and it seems like the company is working hard to prove that point by announcing several new enthusiasts-oriented product at at the on-going Game Developers Conference 2014 including an upcoming 4th generation Intel Core processor codenamed Devil’s Canyon. As you can see in the slide above, Intel claimed that Devil’s Canyon was re-engineered to deliver enhanced performance and overclocking. This is apparently done through improved thermal interface and CPU packaging materials. 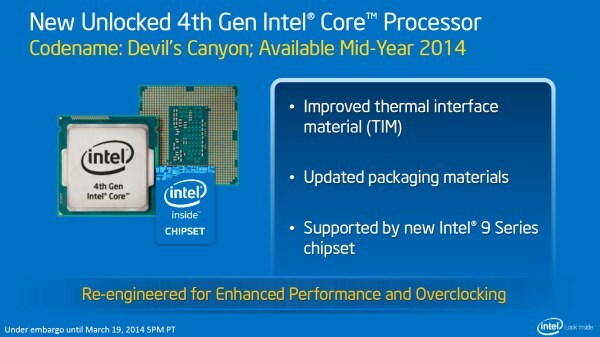 Since it is overclock-friendly, the Intel Devil’s Canyon processor has unlocked modifier as well. Not to forget, the processor will be supported by the equally new Intel 9 Series chipset. At this moment, these are the only information that we have on the new Intel Devil Canyon’s processor in addition to its release date which is said to be sometime in mid-2014. We’ll keep you updated once we able to obtain more information regarding it from Intel.